Munich - Which summer signing will make the biggest impact at his new club in the upcoming Bundesliga season? The votes are in and almost three-quarters of them were hoovered up by two players born within weeks of each other in 1992. The runner-up, with an impressive 33 percent of ballots cast - more than double that of third-placed Max Kruse - is South Korean supertalent Heung Min Son, fresh on the books at Bayer 04 Leverkusen. Son, who turns 21 in July, has been snapped up by the Werkself on a five-year contract to fill the gap left by Chelsea-bound Andre Schürrle and he took his leave of Hamburger SV on the back of a fine individual campaign for the Red Shorts, twelve goals included. Bayer fans are eagerly anticipating more of the same, both at home and in the UEFA Champions League. The club, along with many bundesliga.com voters, are confident that Son can develop as effective a partnership with Bundesliga top scorer Stefan Kießling as did Schürrle last time around. The general confidence level in Mario Götze's chances of whipping up even more of a storm at FC Bayern Munich is even higher, though. No less than 40 percent of users who cast a vote reckon German football's ultimate current Wunderkind will have an impact unparalleled by any other new signing in his debut season with the all-conquering Bavarians. Götze, who turned 21 at the start of June, bowed out at Borussia Dortmund with ten goals and eight assists in the Bundesliga, to add to some stellar displays in the international arena as BVB stormed through to the final of the UEFA Champions League. The all-round attacking talent missed out on the showpiece Wembley head-to-head with his future employers due to a muscular injury picked up early on in the second leg of Dortmund's semi-final encounter with Real Madrid. That subsequently proved to be a more serious hamstring problem which will curtail his pre-season preparations under new FC Bayern coach Pep Guardiola. Once he is up and running again, however, expectations are clearly high all-round that Mario Götze will soon be reproducing in red the breathtaking form he habitually demonstrated in yellow and black. 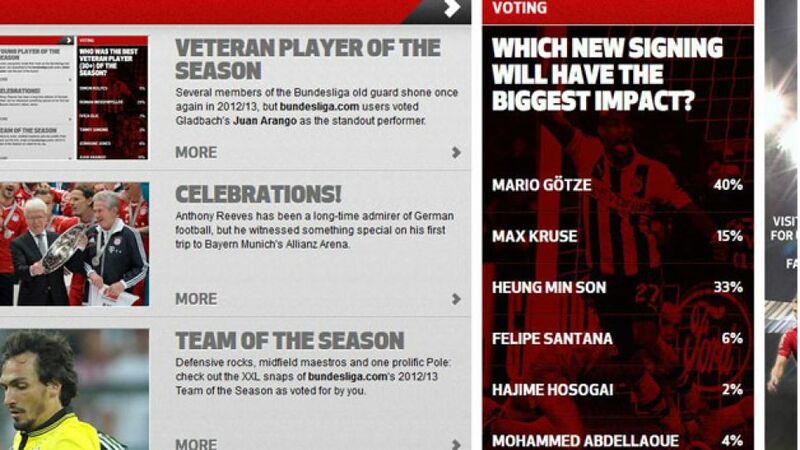 Remember to check out the new vote on our Fanzone page!